I would come to go ahead with the topic of management of hypertension and diabetes. Most of us are diabetologist, most of us are treating hypertension, and we have got the importance of what Hypertension is just now. 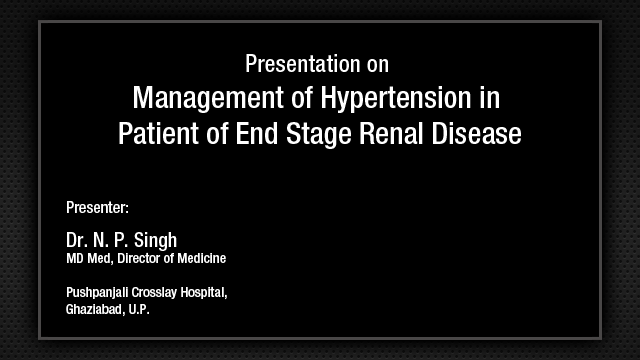 We just went across how you will take blood pressure management then how to take a blood pressure, then we saw how isolated systolic hypertension should be managed, then Dr. Singh was telling about end-stage renal disease and hypertension. Today, I am here to talk to you something about the hypertension and diabetes. I see many of the people are also diabetologist here, because many people who travelled with me practice diabetology alone and some people practice hypertension alone. So we join them together and we find that hypertension is purely and as already mentioned is very sparsely identified in many of the population. Can significantly accelerate the development and progression of both the micro and the macrovascular complications. Whenever we talk about diabetes, we think about the microvascular complications or we look into macrovascular complications, so we need to aggressively, as the inaugural speech was given by Mr. Joshi, he said you have to bring down hypertension. He says he is sending vans everywhere to measure the blood pressure of people, so it is highly essential that we have to bring down hypertension, so that we can reduce the healthcare cost also. Today, nearly two-thirds of the people with diabetes; do not have blood pressure readings under the target range. They do not come under control. They keep coming once in a way, get their blood sugar checked, but the hypertension does not come under the control range, so we need to effectively bring down antihypertensive regimens that will be helpful to treat hypertension in the setting of diabetes. 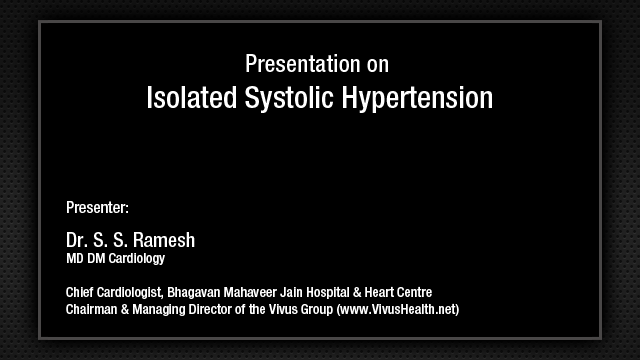 We find in this slide that the association of systolic blood pressure, which is already mentioned by Dr. Ramesh who said what is systolic blood pressure and how it is importance, you find that systolic blood pressure in men with cardiovascular mortality is high when the blood pressure rises, so we will be looking in to all of this. Initially, we will be looking up to the epidemiology, the factors favoring hypertension and diabetes, the rationale management of hypertension and diabetes, a few clinical trials, I will run through for want of time, and how to get a target blood pressure in diabetes. 20.6% of the Indian patients have hypertension and diabetes coexisting. It is very important. 75% of the people in the world with diabetes have hypertension, of course most of us as Dr. Singh was saying everybody is going to go have something, the salt and all the food that we are going to take, we have obesity in around independent predicted of hypertension, 40% of the patients with hypertension have a BMI of more than 30. Microvascular and macrovascular complications are more common in patient with diabetes who also have hypertension. Along with hyperglycemia, dyslipidemia, and cigarette smoking, most of us know that all these are cofactors that are related to the progression of the disease, hypertension is a major contributor to the development and progression of macrovascular and microvascular complications in people with diabetes. Compared to the general population, people with diabetes face a two-to-fourfold increase of cardiovascular risk, so concomitant hypertension it adds to it and triples the already high risk of the disease. Here, in normal when there is no diabetes, you find that as the blood pressure increases, people have more of cardiovascular events that can occur both male and female and smokers and nonsmokers and comparative data has been put where you have a lesser risk in woman, but more in men. In diabetes, you find that the red boxes are more high because as the blood pressure rises the incidence of cardiovascular events in 5 years also increases dramatically. Hypertension significantly accelerates the progression of diabetic nephropathy, retinopathy and neuropathy all of us know about it. Of particular importance, a systolic blood pressure is a stronger predictor than diastolic blood pressure for both cardiovascular disease and renal complications and people with type II diabetes, the prevalence of hypertension is 50% at the time of diagnosis, so we will have to identify it, increasing to 80% in the presence of microalbuminuria, and to 90% with macroalbuminuria. Although, population based data are limited between 30 and 43% of the adults, type I diabetes also have concomitant hypertension. Onset of hypertension in these patients frequently correlates with onset of albuminuria. 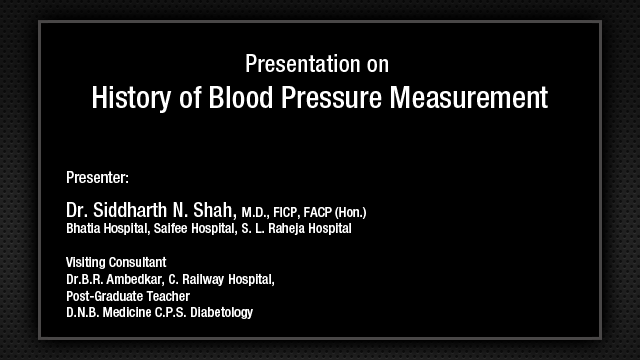 Now lets look at the factors that are favoring hypertension in diabetes. The main factor is hyperinsulinemia, volume expansion, increased arterial stiffness, and of course diabetic nephropathy. Hyperinsulinemia is due to insulin resistance mainly in type II diabetes, auto-insulin administration may increase the systemic blood pressure. In a study that was conducted in 80 people of type II diabetes began on insulin, the blood pressure rose from 130/81 to 150/89 mmHg. This hypertensive response although not noted in all studies may be mediated by concurrent weight gain that has been noted in patient who are on insulin. Hyperinsulinemia may be a link to explain the association between obesity and hypertension and both nondiabetic patients and those with type II diabetes since insulin can increase sympathetic activity and promote renal sodium retention. The second factor, which I mentioned is volume expansion there you find that sodium retention and volume expansion may be induced both by insulin and the hypoglycemic state. The excess filtered glucose is reabsorbed and in the proximal tubules via sodium-glucose co-transporter resulting in a parallel rise in the sodium reabsorption. Then, salt loading tends to raise the blood pressure on effect that can be reversed when we advise the patient on salt restriction. The third factor is the increased arterial stiffness. Patients with diabetes can have increased vascular stiffness. This is thought to be consequence of an increased protein glycation and, at the later stage, it can go on to form an atheromatous disease. The reduction in arterial distensibility, which is seen with both impaired glucose tolerance and overt diabetes can contribute to the rise in systolic pressure and is associated with mortality risks. The last factor which I mentioned of the four is diabetic nephropathy. Hypertension is highly prevalent in patients with diabetic nephropathy. Diabetic nephropathy is the leading cause of chronic kidney disease and end-stage kidney disease and the etiology of hypertension in diabetic nephropathy involves mechanisms with multiple interrelated mediators that result in renal sodium reabsorption and peripheral vasoconstriction. We have been talking much about the metabolic syndrome and we attribute the risk factors of abdominal obesity, elevated blood pressure, elevated fasting glucose, elevated triglycerides, and low HDLc levels. Angiotensinogen from fat cells can increase angiotensin II and thus also increase blood pressure. Both systolic and diastolic blood pressure increase with increasing body mass index. Today, our problem is obesity and we want to control obesity in various methods. People go to gyms, they try to reduce their weight, they reduce their diet, but somehow rebound diet situation occurs, so they counteract for whatever food they take at a lesser time, so you find that there is subcutaneous fat accumulation, abdominal muscle layer also has accumulation and intraabdominal fat can also accumulate. What is the role of abdominal adipocytes and insulin resistance in heart disease? You have abdominal adipocytes, there is increased adipocytokines and fatty acids, insulin resistance which can lead on to a metabolic syndrome and lastly they all can lead on to heart disease. They increase visceral stores, they can increase portal free fatty acids, hepatic insulin clearance, increase plasma insulin and increased renal sodium reabsorption leading on to hypertension and have a vascular constriction which can cause hypertension and of course the RAAS, the angiotensinogen, angiotensin I, angiotensin II which all can lead to vasoconstriction leading on to hypertension. So, this is the picture which all of us know the angiotensinogen, the angiotensinogen I, II and how the angiotensin converting enzymes and angiotensin receptor blockers act. What are the effects of angiotensin II? They have a pressor effect, a pro-inflammatory and promotion of inflammatory response and atheroma, increased oxidative stress, increased sodium reabsorption, increased insulin resistance through all the factors that I mentioned there. There is also reduction in the nitric oxide production of endothelium that is increasing vasoconstriction and also the increase in the TGF-beta. What are the effects of obesity? You have a monocyte infiltration, ectopic fat distribution in the various places, increased fatty acid production associated with cardiac insulin resistance and fibrosis, decreased adiponectin. This adiponectin exhibits potent anti-inflammatory and anti-atherosclerotic effects. This picture most of you would have seen, the TV size which his decreasing and the man which is increasing. The cardiometabolic syndrome, which involves the visceral obesity enhance liposis, free fatty acids, all the factors given above and there is also an increased central fat endothelial dysfunction, hypertension, albuminuria, which all can lead on to atherosclerosis. Patients with insulin dependent type I diabetes are prone to develop nephropathy often have a familial predisposition and sodium retention occurs as a characteristic alteration in type I or type II diabetes, exchangeable body sodium is increased by 10% on an average. This abnormality develops in uncomplicated stage of diabetes and differentiates diabetic from nondiabetic essential hypertensive subjects. The role of sodium retention in diabetes associated hypertension is supported by positive correlations between systolic or mean blood pressure and sodium concentrations and by the normalization of blood pressure after removal of excess sodium by diuretic treatment in hypertensive diabetic subjects. Additional factors that are favoring hypertension in diabetes is the increased sympathetic tone, the endothelial dysfunction associated with hypoglycemia, and also the genetic factors. What is the rationale of management of options for treatment of hypertension in diabetes? So many things going around, so many drugs available, so many molecules as on date, so many clinical trials that are coming or still on, JNC-7 and 8 is still in the anvil, as already mentioned by Dr. Ramesh, he said it is still coming for the last 1-1/2 years we have been waiting for it, many comorbidities, varied outcomes of interest and lot of cost constraints. What are the benefits of early detection and treatment? We have to prevent cardiovascular disease, we have to minimize the progression of the renal disease, to minimize the progression of diabetic retinopathy and among patients with type II diabetes the benefits of tight blood pressure control may be great or greater than the benefit of strict glycemic control. So, the inhibition of the RAAS in the prevention of diabetes complication nephropathy, way back in 1993 the various things that were published, i.e., decreased proteinuria, decreased dialysis, ACE inhibitors and angiotensin receptors have demonstrated improvement in renal function. I think much will be spoken about this tomorrow about ACE inhibitors and all the drugs, so I will just touch on that, I will run through rapidly. Renal protection has not been shown for patients without hypertension or microalbuminuria. So, as the blood pressure increases, you find that the proteinuria also increases. This is just to show that as the blood pressure increases you can have increased proteinuria as you find in the slide. Inhibition of RAAS and the cardiovascular disease in diabetes, trials for prevention of cardiovascular end point required larger patient population then those used to study nephropathy. These have subsequently shown that cardiovascular endpoints improved with ACE inhibitors and angiotensin receptor blockers so the various studies that have substantiated to identify the ideal drug have been mentioned. The UKPDS study is a long study with about 1148 patients randomized to tight control or less tight control. The tight control is defined as a blood pressure of less than 150/85 and the less tight control is defined as a blood pressure of more than 180 and 150 of diastolic. So you will find in the end of the study that 758 patients allocated to tight control, 400 were on captopril and about 358 were on atenolol. The agents were equally effective in lowering blood pressure, so both were equally good. Similar effects on reducing macrovascular events and microvascular complications were seen. These benefits required continued maintenance of a lower blood pressure, the greater reduction in blood pressure and the lower risk of complications in patients assign to tight blood pressure control was lost within 2 years of termination and a significant improvements in clinical end points were not sustained. So, this is the graph that shows the tight BP control and the less BP control and the implications that can occur because of that. The second trial is the HOT trial (Hypertension Optimal Treatment). About 18,790 patients from 26 countries between the age group of 50-80 were seen. They main concentrated on the diastolic blood pressure to find that the diastolic blood pressure of 90, 85 and 80 and they found it was best to maintain the patient on the diastolic blood pressure of 80. The third trial is the ABCD trial (Appropriate Blood Pressure Control in Diabetes). They compared intensive versus moderate blood pressure control on the incidence of progression of complications in type II diabetes of 470 patients with entry diastolic blood pressure of more than 90 followed for about 5 years. The compared effect of calcium channel blocker, ACE inhibitors were found. Endpoint: The change in creatinine clearance as primary and development of microvascular complications and cardiovascular disease were secondary. The other trial is the ABCD trial the results were the BP attained for the last 4 years, it was seen that about 132/78 mmHg for intensive, 138/86 mmHg for the moderate. There was no difference in the creatinine clearance between moderate and intensive. No difference between groups and those had progressed from normo to microalbuminuria or micro to macroalbuminuria. Intensive therapy had a lower overall incidence of death. No difference in progression of retinopathy or neuropathy and there was no difference in results based on calcium channel blockers or ACE inhibitors. The ONTARGET trial: Most of us know about this trial because we were all trying to combine both ACE inhibitor and angiotensin receptor blockers, but no definite end point was received. Individually, both the drugs are good and they can be used together. The HOPE trial (Heart Outcomes Prevention Evaluation): The objective is to evaluate the effect of ramipril on the prevention of cardiovascular composite end point of death from cardiovascular causes, myocardial infarction or stroke. The HOPE results: We found that ramipril treated patients reach primary end point at rate lower than placebo and ramipril reduced rate of death from any cardiovascular cause. So, the HOPE trial you can find the placebo and the effect on ramipril it was much better. The ADVANCE trial (Action in Diabetes and Vascular Disease PreterAx and DiamicroN Controlled Evaluation): The various centers that were selected and found the death from cardiovascular disease, nonfatal stroke or nonfatal MI, new or worsening renal or diabetic eye disease and the study was conducted for about 4.3 years of followup, compared to placebo there was a drop in the pressure about 5.6 systolic and 2.2 diastolic mmHg. There was not a significant decrease in the macrovascular events or microvascular events and there was a 9% decrease in combination. There was a decrease in the cardiovascular death and death from any cause that could have been mentioned. The ACCORD trial (Action to Control Cardiovascular Risk in Diabetes): There was no difference between groups in terms reaching the primary outcome composite. There was a decrease in the rates of stroke and lesser rates of progression of albuminuria. There were more adverse events in the intensive group and this study has been a source of commentaries and discussion about how far to go with BP lowering. Combination therapies have been used, calcium channel blockers combined with angiotensin receptor blockers, these trials have all proved in different ways that it is very useful to use the drugs that we just mentioned, either angiotensin receptor blocker or ACE inhibitor or beta blocker or a calcium channel blocker. Other studies I am going to just mention them and run through: The studies of left ventricular dysfunction, the use of enalapril, and the advantage of losartan and atenolol the comparative studies that have been done, the ALLHAT study, and the ROADMAP study. Before concluding I will go through the various trials and studies that have been done and the role of olmesartan that we are using currently. Already people have mentioned about the nonpharmacological methods of therapy. Sodium restriction has been tested in the diabetic population in control trials. However, results from the control trials in essential hypertension have shown a reduction in the systolic blood pressure and diastolic blood pressure. Also, sodium restriction and daily intake of about 200 millimoles should be advised for these patients. A dose responsive effect has been observed with sodium restriction even when pharmacological agents are used there is often a better response when there is concomitant salt restriction due to the aforementioned volume component of the hypertension that is almost always present. The efficacy of these measures in diabetic individuals is not very much known. Physical activity, as already mentioned, very important, smoking cessation all this play an important role and the current ADA recommendations for treatment of blood pressure says blood pressure should be measured at every clinic visit, patients found to have blood pressure at the range of 130 to 80 mmHg and confirmed on a separate day have hypertension and should be treated. So, you should start treating these patients. As mentioned lifestyle interventions, weight loss, sodium reduction, moderation of alcohol and increased physical activity. Pharmacological therapy for patient should include either an ACE inhibitor or an angiotensin receptor blocker. Also recommend for patient with persistent microalbuminuria are high levels of albumin excretion. Now, looking into this algorithm, treatment of hypertension in association with diabetes, if diabetes with nephropathy without nephropathy. With nephropathy, the threshold equal of about 130-80 mmHg and target below that should always be maintained. There should be with nephropathy and ACE inhibitor or an angiotensin receptor blocker. Without nephropathy, going for an ACE inhibitor or thiazide group of diuretic or you have a combination of two drug combinations. In concluding, the treatment of hypertension in diabetic patients was associated with significant clinical benefits in three major randomized trials; the UKPDS trial, the HOT trial, and the ADVANCE trials. Major guidelines published before the ACCORD BP suggested that the goal blood pressure in patients with diabetes mellitus should be less than 130/80 mmHg. The ACCORD BP trial of patients with type II diabetes at increased cardiovascular risk found no significant cardiovascular benefit and more drug side effects at the mean attained systolic pressure of 119 and compared to 133 mmHg with the exception of reduction in stroke. A number of other studies have found that incidence of stroke, but not coronary disease continues to fall at systolic pressures below 125-130 mmHg. The choice of antihypertensive agents in diabetic patients is based upon their ability to prevent adverse cardiovascular events and to slow progression of renal disease if present. The choice is not based upon retinopathy end points since comparative trials have not demonstrated superiority of one agent over other in retinopathy. A good blood pressure of less than 140/90 is recommended compared with higher pressure. A goal blood pressure of less than 130/80 mmHg is recommended compared with higher pressures in patients with diabetic nephropathy and proteinopathy. There is no data that supports that use of ACE inhibitors or ARBs prior to the development, so if a diabetic comes to you without hypertension, you need not start them on an ACE inhibitor and angiotensin receptor blocker for hypertension or microalbuminuria. Further, lowering of blood pressure to values of less than 120/80 mmHg is not associated with an improvement in cardiovascular events and is associated with increased side effects. So, to conclude may you become the melody for the hypertensive and the diabetic patients.